Um, I’m gonna need to borrow someone’s baby for a minute. 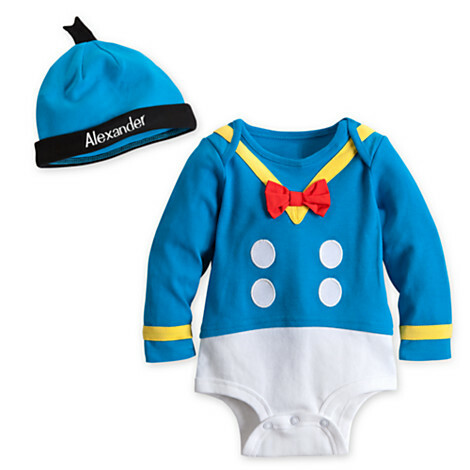 I’ll give him right back, but mine is too big to fit in this thing, and I’ve GOT to see somebody’s real live baby in this Donald Duck Bodysuit! You can get his or her name stitched on it, but I personally would go with Donald, because I think it would be hysterical. But you do want you want, since you’re letting me borrow your baby. This cute little thing is on sale right now for $13.96. They have cute Mickey, Kermit, and Pooh Suits for the wee ones, too! Check out our Disney Halloween Costume Gift Guide to start getting getting geared up for this year’s festivities!